Don’t you just loveWORDS?! How fascinating that the Creatorof Life decided to use little clusters of letters as His means of communication with Him, and prescribed the same means for us humans to connect at the deepest levels of our hearts. Scripture makes it clear that WORDS have the power of life and death. WORDS can inspire a person to incredible feats, or WORDS can rip out one’s heart. Satan’s lies can destroy, while God’s Truth always heals and blesses anyone who believes it. Have you noticed the haphazard way in which so many people today, even those in the public eye, use words, and how bad their grammar is? That’s because the Devil, the “father of lies,” is doing his best to cripple people’s communication skills, and his primary goal is to stop people from (a) reading, (b) understanding, and (c) sharing with others the written Word of God. Such folks need to stop laying around so much and perservere so as to improve their comunication skills so they can convince others to follow the Lord Jesus. And they can do so knowing that one benefit of being born again is having some friendly guardian angles, each of which can spell. Can you? Speaking of WORDS, have you noticed the progression of topics in the last few FODs? We are doing our best to set forth pertinent and practical truth that you can both apply and share with others. In April we wrote about The Death of Death, elucidating the great truth about our glorious Hope guaranteed us because of the Resurrection of Christ. In May for Pentecost we wrote Signed, Sealed, and Delivered, expositing what God says about the permanence of our salvation and the phenomenal proof of that we have via speaking in tongues. In June we sent you, Are You Letting Your Conscience Be Your Guide?, elaborating upon what the Bible says about the role of one’s conscience. Last month you received Cultivating Your Garden of Grace, in which we set forth the indispensable biblical truth of grace unto works, showing that we work for God not to gain anything from Him, but because He saved us and we are so thankful. In this FOD, we’ll consider how to overcome F-E-A-R of speaking the Word to people. Been there, not done that due to such fear. So what are we afraid of? Being killed? No. Beaten up? No. Put in jail? No. Stripped of all possessions? No. Kicked out of a church of wonderful people that teaches the Truth? No. Looking foolish? Too late. I guess it would be rejection—someone thinking less of me than I like. So the question to ask is, “So what?” Also, “Who is rejecting me?” If it were someone who means a lot to me—God, Jesus, Elizabeth, or Steph Curry, one could understand, though not condone, my sheepish silence in the face of great human need. But why should I fear what someone I hardly know thinks of me. AND, if I do open my mouth and speak words of light and life…THEY MIGHT BELIEVE!! !—right then, or later while they ponder my words as the “good seed” I planted germinates within them. If I don’t speak, they can’t believe. 41So they departed from the presence of the council, rejoicing that they were counted worthy to suffer shame forHis name. 42And daily in the temple, and in every house, they did not cease teaching and preaching Jesus as the Christ. The power of words, and their judicious use in any relationship, cannot be overstated. One of my favorite Bible words is the Greek word parrhesia, usually translated “boldness.” It literally means to say what needs to be said when it needs to be said how it needs to be said to whom it needs to be said. Yes, the content is most important, but Jesus was The Master at confronting people in a way that they could see the benefits of following his advice. In this month’s live WWF, Freedom of Speech? I share a word study on parrhesia. Hope you’ll listen to it soon. 11For the Scripture says, “Whoever believes on Him will not be put to shame.” 12For there is no distinction between Jew and Greek, for the same Lord over all is rich to all who call upon Him. 13For “whoever calls on the name of the Lord shall be saved.” 14How then shall they call on Him in whom they have not believed? And how shall they believe in Him of whom they have not heard? And how shall they hear without a preacher? 15And how shall they preach unless they are sent? As it is written: “How beautiful are the feet of those who preach the gospel of peace, Who bring glad tidings of good things!” 16But they have not all obeyed the gospel. For Isaiah says, “Lord, who has believed our report?” 17So then faith comes by hearing, and hearing by the word of God. As Christians, we need to be aware of any laws being considered or passed that dilute our cherished freedom of speech. Today we live in what some call a “post-truth culture,” and the prevailing standard dictates that it is evil to judge others’ beliefs. Our culture now leans toward restricting “startling” speech. Oh, you mean like Peter’s piercing, provocative, precise, penetrating Pentecost proclamation? OK, he’s sorry about that; he didn’t mean to offend anyone. Are you kidding? It was that dynamic discourse that launched the Christian ekklesia! 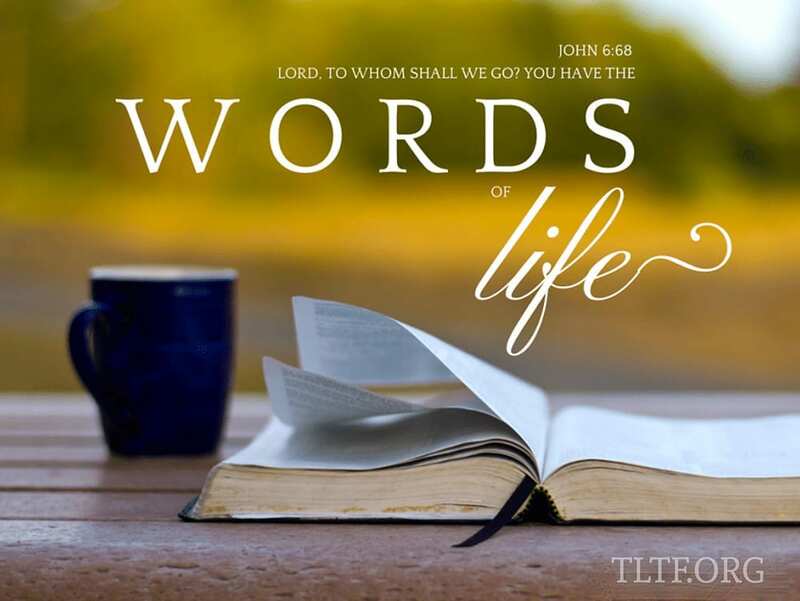 TLTF belongs to everyone who “belongs to the truth.” This is your ministry. It is your gifts that enable us to reach out with God’s Word. It is your sharing the Word with people that gives God the opportunity to win their hearts. And it is your prayers that somehow help give God entrée to reach them (cp. Eph. 6:19-20). Will you please make it a priority to PRAY that everyone who loves what we teach finds hungry souls in that same category? Maybe we can see an influx of believers before the Lord Jesus shows up and has to sort of “re-introduce” himself to those brethren who think he is God. Thank you for praying for Elizabeth and me to get the “God-deal RV” that He has for us somewhere on the planet so we can hit the road asap (early January?) and minister to God’s dear saints—and stir up trouble for the enemy. TLTF definitely has “the product” that some people want: Truth. The sad thing is that 99% of Christians cannot tell them what you can tell them about the Word. Why? Because although they mean well, no one has taught them the Truth. On the contrary, YOU have heard the Truth, so you can share it with those who need it. What a privilege! There is no power in what we do not say. God cannot back up words we do not speak, but when we speak His Word into a situation, He unleashes His power to bring to pass His Will. Each day is a new day, with different people coming into your life. GO, STAND, SPEAK to the people all these words of life!